Spent an enjoyable few minutes today looking at the incredible machines on the Bicycle Forest site. 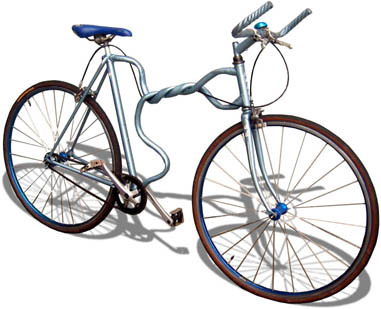 My favourite part was the homebuilders’ gallery, 25 pages of wierd and often wonderful creations that can (sometimes loosely) claim to be bicycles of one flavour or another. Speaking of which I sw someone cycling one of Sir Clive Sinclair’s A-bikes in London tonight (you know the one where trolley wheels meet folding frame. Couldn’t decide whether to admire or (silently) mock the pilot, although was dead impressed the speed he got…rim speed on those tiny wheels must be close to supersonic! Nice find! I love the BikeCAD program!